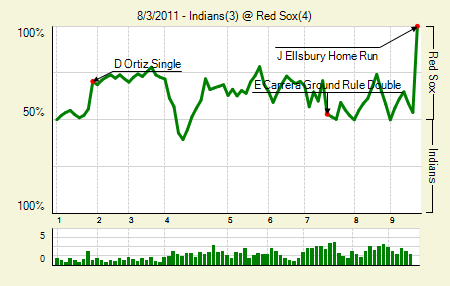 Moving the Needle: Jacoby Ellsbury walks off with a homer, +.461 WPA. It seemed as though they were tied all game. The Red Sox did have a 3-2 lead for a few innings, but in the seventh the Indians tied it up. They remained tied until the bottom of the ninth. With two outs Ellsbury got a hold of one and drove it out to deep center. Over the wall it went, and again he played the hero for the Sox. Jason Kipnis: 1 for 2, 1 HR, 2 BB. He’s had a nice little start to his career: 8 for 33 with two doubles, four homers, and three walks. Moving the Needle: Michael Cuddyer’s grand slam breaks a 4-4 tie in the fifth, +.275 WPA. The Angels had a lead in this one after they put together four runs in the third. The Twins tied it up the next inning, and then in the fifth they took the lead for good. 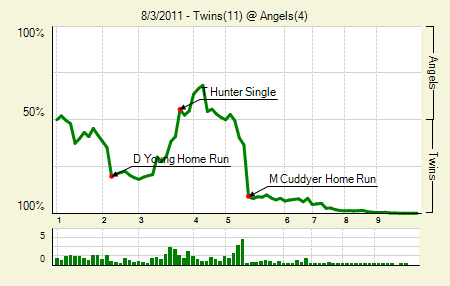 With one out they got a pair of singles and a walk before Cuddyer popped one over the center field wall. He’d add another homer, this one a solo shot, in the ninth. Delmon Young: 2 for 4, 2 HR, 1 BB. He helped put some runs on the board early with his pair of homers, which is as many homers as he’d hit in his previous 279 AB. Anthony Swarzak: 5 IP, 1 H, 0 R, 1 BB, 1 K. Starter Scott Baker lasted only three innings, so this was a serious boost for the Twins. 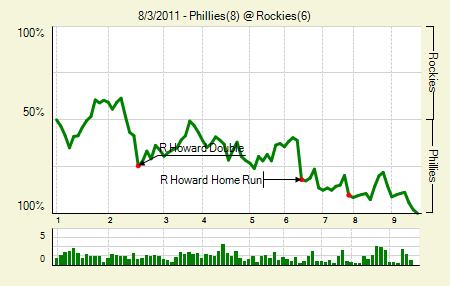 Moving the Needle: Ryan Howard keeps his hot streak going with a homer, +.209 WPA. The Phillies have looked pretty indestructible lately, and Howard is a big reason why. He’s had a ton of big hits, not least of which was his two-run blast in the sixth inning yesterday, which put the Phillies up by three and helped insure the victory. It completed Philly’s sweep of Colorado and extended their dominance over NL opponents. Howard also had a double in the game; he drove in four total. Todd Helton: 2 for 4, 1 HR. He drove in three, but the rest of his team wasn’t really up to the task. Chase Utley: 2 for 3, 1 BB. He scored twice, which is what happens these days when you’re hitting in front of Howard. Moving the Needle: Dontrelle Willis breaks the tie with a solo homer in the seventh, +.241 WPA. It’s not often you see a pitcher hit for himself late in a game, when the manager could conceivably remove him. In fact, Dusty Baker did remove Willis for the seventh, but let him bat in the sixth. It paid off, as his solo homer broke the 2-2 tie. Of course, the actual replacing of him backfired, as the Astros took a lead before making an out, and went on to win the game. J.D. Martinez: 3 for 4, 1 2B, 1 HR. He drove in four, including a pair in the seventh to take the lead. Jason Michaels and Jimmy Paredes: 2 for 4, 1 2B each. There was a time, not too long ago, where Michaels would have been a valuable deadline commodity for the Astros. Moving the Needle: Robinson Cano’s three-run shot gets the scoring barrage started, +.141 WPA. The Yankees started off the game with a little small ball, bunting for a pair of base hits and then benefitting from a bloop single. 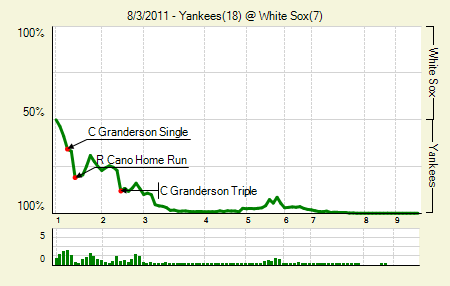 A run did score before Cano’s homer, on a sac fly, but it was his bomb to right that put the Yanks up big in the first. They got another two in the second before rallying for seven in the third and four more in the seventh. Curtis Granderson: 4 for 6, 1 2B, 1 3B. He drove in a season-high five runs. Derek Jeter: 5 for 6, 1 2B. 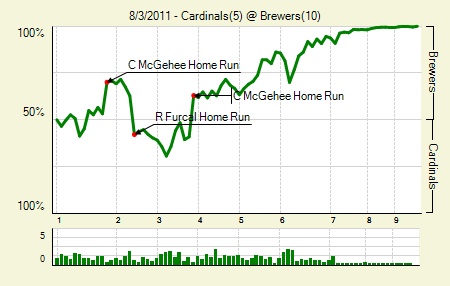 Moving the Needle: Casey McGehee hits his second homer, giving the Brewers a lead, +.221 WPA. 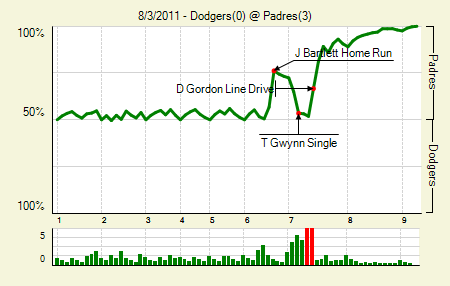 Three times McGehee homered in this one, though the last one was simply for show. The first two made big differences in the game. In the first he hit a two-run shot to break a 1-1 tie. Then in the third he did it again, another two-run shot that turned a 4-3 deficit into a 5-4 lead. His teammates came through with support in the fifth and sixth, leading to a big win. Corey Hart: 2 for 6, 1 HR. Despite his power being down a bit, he’s still producing at a level comparable to last year. Rafael Furcal: 2 for 3, 1 HR, 1 BB. He drove in four of the Cardinals’ five runs. He’s now 4 for 14 with a homer and two walks in his new digs. Moving the Needle: Alex Avila breaks the tie with a solo homer in the sixth, +.187 WPA. 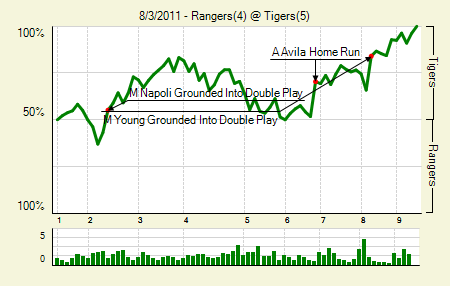 In the middle innings the Tigers watched a 3-0 lead fade away, but they gained it back later on. Avila homered in the sixth to give the Tigers a 4-3 lead, and then Ryan Raburn hit one in the eighth, which turned out to be quite useful, as the Rangers picked up one of their own in the ninth. But it still gave the Tigers the W and a further extension of their lead in the Central. Miguel Cabrera: 2 for 4, 1 2B. Josh Hamilton and Nelson Cruz: both 2 for 4, 1 2B. They each drove in one and scored one as well. 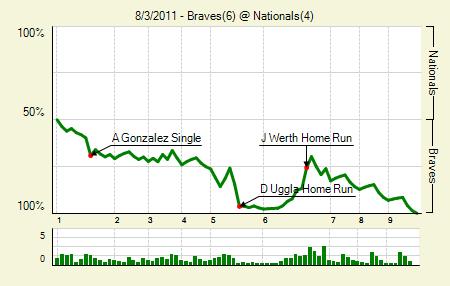 Moving the Needle: Dan Uggla continues his hot streak with a homer, +.118 WPA. The Braves jumped out to an early lead, scoring two in the first. In the fifth they rallied for four, which Uggla capped with a three-run shot. It extended his hit streak to 25 games, during which he’s done quite a bit more than the minimum at the plate: .354/.421/.750. Freddie Freeman: 2 for 4. Uggla had the Braves’ only extra base hit, but Freeman did drive in a pair with his singles. Moving the Needle: Alcides Escobar plates a pair with a triple, +.190 WPA. Early leads are good. The Orioles took one in the first when Vlad Guerrero knocked one in with a single, but the Royals got it right back in the bottom half. In the second they got another pair on Escobar’s triple, making it 3-1. 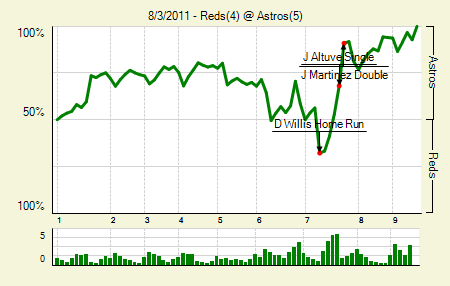 They took control for good in the seventh, though, when a three-run homer busted open the game. 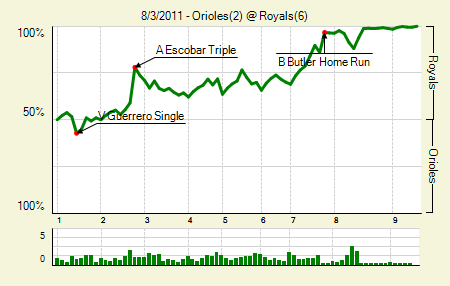 Billy Butler: 1 for 3, 1 HR. He hit the big three-run homer in the seventh. Along with a sac fly, he drove in four on the day. Luke Hochevar: 7.1 IP, 4 H, 2 R, 1 BB, 7 K. He’s gone at least seven and has allowed two or fewer runs in three of his last four starts. It might not sound like much, but it’s definitely something, considering some of the poor starts he’s had this year. Last time he faced Baltimore he allowed eight runs in seven innings. 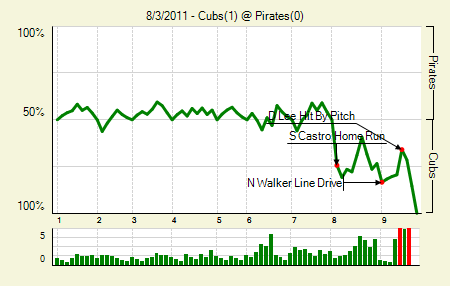 Moving the Needle: Starlin Castro homers for the only run of the game, +.244 WPA. For seven innings both pitchers worked on shutouts. In the eighth, when the bullpens came in, the Cubs struck. That is, Castro struck with his fourth homer of the year. That was it for the scoring, as the Cubs bullpen did a fine job of holding the lead. Matt Garza: 7 IP, 4 H, 0 R, 2 BB, 7 K. He bounced back nicely after getting shellacked by St. Louis last time out. Charlie Morton: 7 IP, 5 H, 0 R, 2 BB, 7 K. He bounced back nicely after getting shellacked by Philadelphia last time out. Moving the Needle: Adam Rosales ends the potential seventh-inning rally with a double play, -.156 WPA. 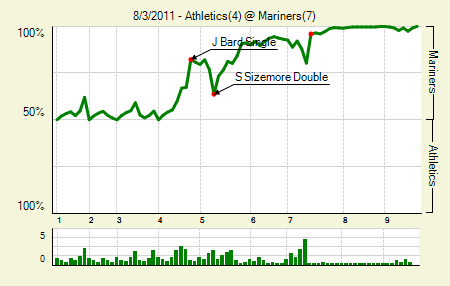 In the top of the seventh the Mariners still had only a modest 4-1 lead, which gave the A’s a chance. Oakland loaded the bases up with one out, on a pair of walks and a single. That brought up Rosales, but he went 6-4-3, ending the threat and putting the game back in the Mariners’ hands. They responded by adding another pair, which helped fend off the A’s mini rally in the ninth. Mike Carp: 3 for 5. The M’s had no extra base hits, and so the man with three hits, two runs, and two RBI is the most notable in the game. Charlie Furbush: 5 IP, 2 H, 1 R, 0 BB, 3 K. He retired the first 13 A’s he faced. He threw only five, I guess, because he hadn’t started a game since July 14th, and that at AAA. Moving the Needle: Jason Bartlett breaks the scoreless tie with a homer in the sixth, +.194 WPA. The description pretty much says it. The starters dueled it out yesterday, with only a few mistakes on each side. Lilly’s only problem came on Bartlett’s homer in the sixth, while Stauffer exited before he could cause any more trouble in the seventh. Still, in a 3-0 game you’d think the starter’s lines would look a bit stronger. Tim Stauffer: 6.1 IP, 6 H, 0 R, 1 BB, 2 K. The walk was intentional. He ran into some trouble in the seventh, putting men on second and third with one out. Ted Lilly: 6 IP, 4 H, 1 R, 1 BB, 7 K. He didn’t even come out for the seventh. That’s strong on account of the Ks, though. 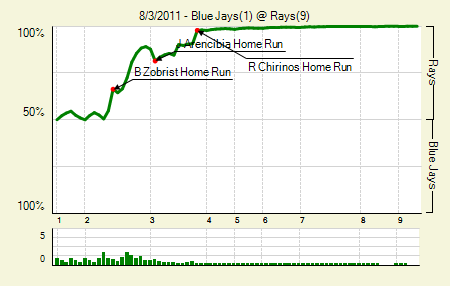 Moving the Needle: Ben Zobrist homers in the second, +.115 WPA. Is there any doubt that Zobrist has been the Rays MVP this season? He got them started yesterday with a solo homer in the second, which started the Rays on their way to a big win against Toronto. Surprisingly, the two teams were separated by just half a game heading into yesterday. Desmond Jennings: 2 for 5, 1 3B. The man is simply unstoppable. Maybe the Rays could have used him earlier in the season; but maybe management picked the precise time in his development when he’d be most ripe for a call-up. OK, it’s probably the former. Robinson Chirinos 2 for 2, 1 HR, 2 BB. He quietly drove in four from the bottom of the lineup. Moving the Needle: Jeff Keppinger sets up a big third inning, +.108 WPA. After losing sole possession of first place on Tuesday, the Giants got back to work Wednesday. Their big move came in the third, when a pair of singles opened the inning. 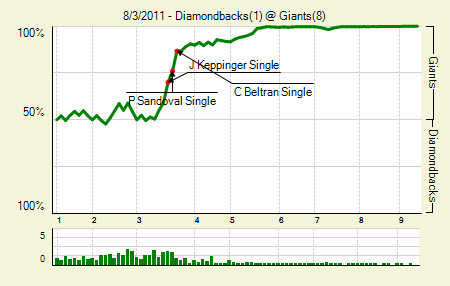 Keppinger’s was apparently the biggest, as it moved runners to the corners with none out. That allowed another two singles to score a pair of runs. An RBI ground out, an error, and a fielder’s choice later, and the Giants had a 4-0 lead. Carlos Beltran: 3 for 5, 1 3B. He has two extra base hits since joining San Francisco, both of them triples. Ryan Vogelsong: 6 IP, 5 H, 1 R, 3 BB, 7 K. He added two hit batsmen to that ledger, which means nine base runners in six innings. Not ideal, but it worked for him in this one. We hoped you liked reading The Morning After: Game Recaps for August 3rd by Joe Pawlikowski! Jeter was 5 for 6, his second 5 hit game of the season. He is quietly having a very good 2nd half: 330/380/490 since coming off the DL.